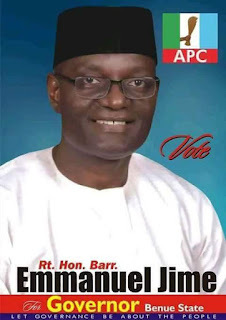 The All Progressives Congress (APC) in Benue State has picked Mr Emmanuel Liambee Jime as its candidate to fly its flag in the 2019 governorship election in the state. 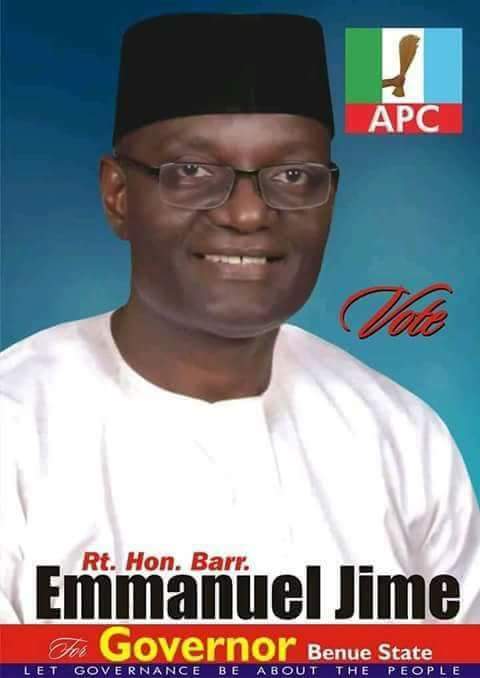 Jime emerged through consensus and was affirmed by the party delegates and declared winner by the Benue APC Electoral Panel Chairman, Mr. Mautiu Are. In his acceptance speech, he said that it’s a great day for the APC and democracy, adding that he is determined to rescue Benue and “to take back our state, our commonwealth and our dignity as a people. We see hope, we see faith, we see resolve that together, determined, we can make it; that together, holding hands and purposely moving forward, we can redeem the promise of our destiny as a great people”. The emergence of Jime took two days as the leaders of the APC led by Senator George Akume had to plead with the other aspirants to step down for him. Jime, a former Speaker of the Benue State House of Assembly, is presently the Managing Director of the Nigeria Export Processing Zones Authority (NEPZA).